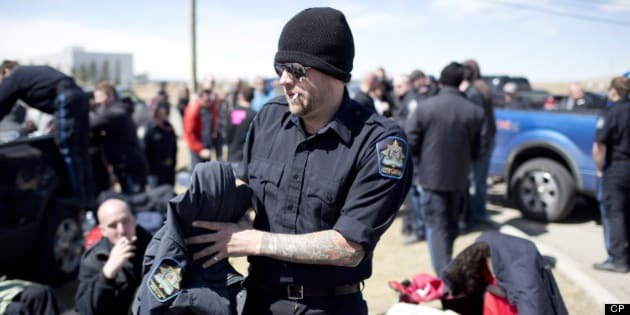 The Alberta Federation of Labour says it will help fight an attempt by the province to suspend the collection of dues by the union involved in the illegal jail guards strike. The province has filed notice that it intends to suspend the deduction of dues and other fees for the Alberta Union of Provincial Employees for six months. Federation president Gil McGowan says under Alberta law the government can apply to suspend the collection of dues for a union local involved in an illegal strike, but not the entire union. McGowan says any such a move would sour relations with workers in other unions. He was joined at a news conference that included the United Nurses of Alberta, the United Food and Commercial Workers union and the Health Sciences Association. McGowan says the federation is also setting up a fund to raise money to help pay the $350,000 in fines that AUPE faces because of the illegal jail guards strike.